Dare I admit that I’ve never seen the movie version of Singin’ in the Rain? Well, I guess I just did. It’s true. I’ve never seen it. Luckily, I did get to see the stage version, and it was everything I could’ve hoped for in my first West End show. 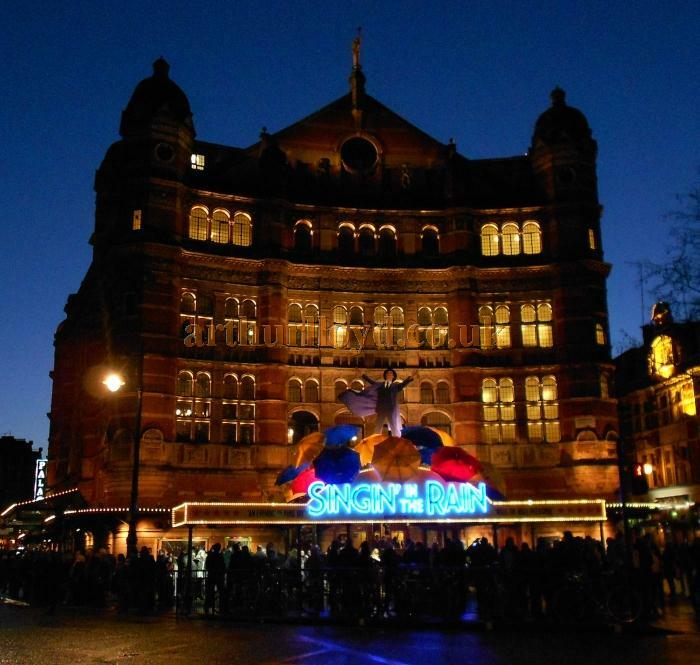 The West End is America’s equivalent of Broadway. 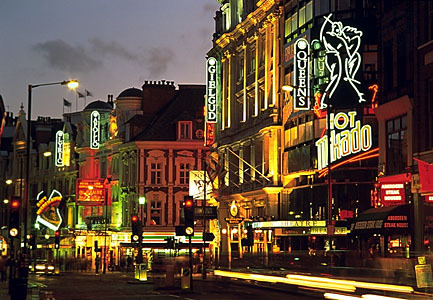 The term “West End” actually refers to a lot of different things, from the theatre area in and around London’s Leicester Square to the expensive shopping district on Oxford Street. For this blog post’s purposes, it refers to the entertainment region, or where the really good shows are. Luckily, I accidentally discovered that February is “Get London to the theatre” month, meaning that West End theatres offer discounted tickets to big shows. Now some of them, like Shrek, I had no interest in seeing (sorry, Donkey). Although Singin’ in the Rain is an American movie, the musical is only playing in England, so I did technically see something British. Our cheap seats were located up approximately five flights of stairs, which the ushers reminded us after every flight. “Your seats are quite high up. You can upgrade for just 10 pounds!” They cheerfully told me. No thanks. The entire reason why I came is because the seats were discounted! So up to the riff-raff area we went, where the seats are rigid and straight-backed with no legroom. They were terrible. The stage was very small from our point of view, but I was so excited to be seeing a West End show no one could rain on my parade (Sorry. I couldn’t help myself). Fortunately, when the lights went out, the riff raff in the balcony made a mass migration to fill in the empty seats in front of them. Naturally, we joined in and moved down. Our seats were somewhat better and I could actually make out the facial expressions of the actors. For those of you who, like myself, have never seen the film, I’ll give a short synopsis. It’s 1927 in Hollywood and Don Lockwood and Lina Lamont are famous movie stars who always play opposite each other in silent films. Lina, a ditzy girl with an annoying nasally voice, thinks that she and Don are lovers in real life. Don, however, has his eyes on Kathy Selden, an aspiring “serious” actress who is unimpressed with the “mock acting” Don does in his silent movies. She also happens to have an amazing singing voice and witty personality, because why wouldn’t she? Suddenly, the invention of the “talkies,” turns the movie world upside down. How will Lina and Don continue their on-screen romance when her voice is so darn annoying and she can’t sing? What about Kathy’s career? What about all of that rain? Oh the agony! (Except there isn’t any because this is the 1920s. Everything always works out ok in the end in musicals from this time period). Overall, the set was sparse compared to American shows I’ve seen. The production used a number of backdrops to change the setting, but mostly set scenes against brick buildings and street lamps. The focus was on the actors, all of whom did a remarkable job. It was weird to travel all the way to London to see a show where the actors spoke in American accents. 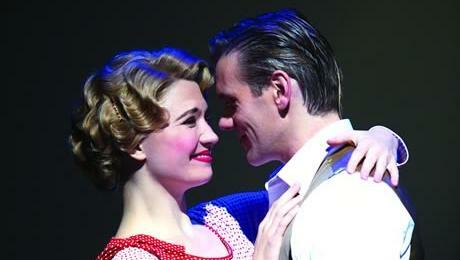 Scarlett Strallen’s (Kathy) British accent tended to pop out quite a bit. She also wasn’t the strongest dancer of the group, as her kicks weren’t as high and her toes weren’t always pointed. What she lacked in footwork she made up for in her vocals. Her voice was crystal clear and perfectly in pitch, even to those of us in the highest of balcony seats. The star of the show was undoubtedly Adam Cooper as Don Lockwood. 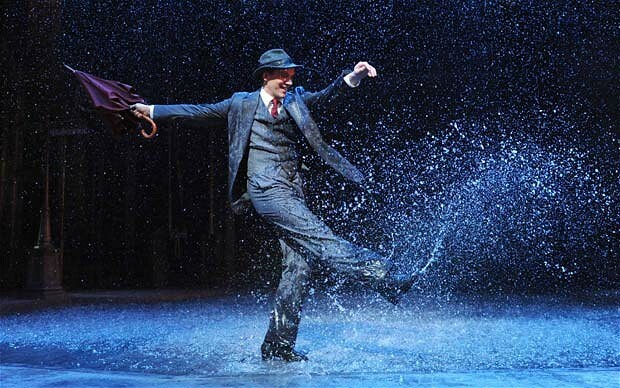 Cooper did Gene Kelly proud. I could tell right away that Cooper was a skilled dancer, so I wasn’t surprised to find out that he’d been schooled at the Royal Ballet School. It was hard to tell his age from the rafters, but Cooper is actually 41. He danced with the grace and fluidity of a ballerino half his age. His tapping was also impeccable, as every wing, flap and shuffle was done with precision. He also proved the theory I have about tap dancing, which is that no matter how difficult the move you’re doing is, people will always clap the hardest when you tap very quickly. For me, Cooper’s dancing was the best part of the show. His voice was excellent and his acting was superb, but his dancing set him apart from every other actor. Now, I’ll be the first to admit that the story itself is a little boring. It’s a love story and nothing monumental happens. Lina becomes a bit of a villain when Kathy replaces her for a musical role, but nothing really comes of the drama. Lina humiliates herself and Don and Kathy live happily ever after. Some parts of the show were quite slow, especially when Don and Kathy stood in one spot and delivered endless love lines to one another. Luckily, these didn’t occur too frequently and were overshadowed by the dance numbers. 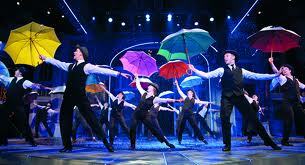 I was a little confused why the show is called Singin’ in the Rain. The number is iconic and has had an enormous impact on pop culture, but no one could’ve known that at the time the movie was released. 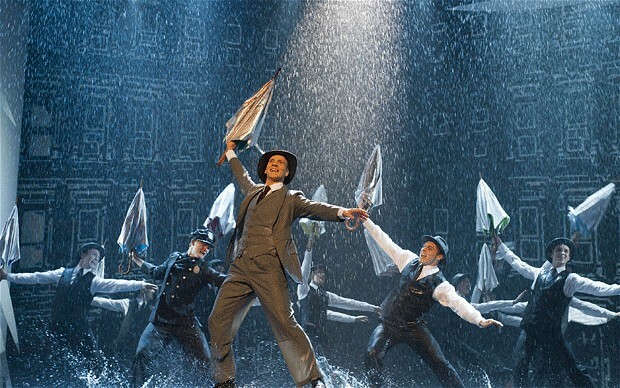 Apparently, when the film was made, the producer told the screenwriters to write a movie called “Singin’ in the Rain.” The song is just one small part of the show, which otherwise focuses on the role of actors transitioning from silent films to musical productions. You would never get that from the title of the film. Then again, Million Dollar Baby is a misleading movie title, too. So what about that rain? Well, it was another one of the best parts. 14,000 litres (that’s about 3,700 gallons) of water are used in each show. Cooper was soaked through while doing the number. He also enjoyed kicking puddles into the front row of the audience, which I dubbed the “splash zone.” The audience seemed to like it though; because they squealed with delight each time he did it. I suppose Londoners are used to rain. The stage crew came out and squeegeed the stage at intermission. They resembled the grounds crew at a baseball game. They stayed in perfectly straight lines when using their mops so that every drop was picked up. The closing number was another big splash (I had to) because the entire cast wore raincoats and twirled colored umbrellas while dancing to the iconic song. I thoroughly enjoyed it and left the show humming Singin’ in the Rain on an endless loop. This show is not for people looking for underlying symbolism and hidden metaphors. (It was raining when I left the show, so I guess that counts as some symbolism. Or just London being London). It is lighthearted, enjoyable and fun, which was perfect for a night out, even if I did have to hunch over to watch it from five stories up. ← High Tea, Cupcakes and … A Call from Jesus?